St. Mary’s Academy 6th grader Max Lewis has a pretty big jar he uses to collect loose change. Judging from the way Max describes it, it’s about the size of a small barrel. Max felt that getting a new playground for his Baldwinsville school was worth donating half of the coins in his giant money jar. Now that St. Mary’s students can clamber over and under the colorful bars and slides and rock wall, he is proud to have helped. “Yeah, I feel good that I spent my money on it,” he said with a satisfied look. Nine-year-old John Massaro did his part to raise money for the school’s playground by buying sweets at bake sales. His family also chipped in and bought a fundraiser brick. 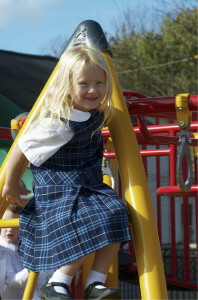 According to St. Mary’s Principal Renae Henderson, the pre-K through 6th grade school was without a playground for decades. 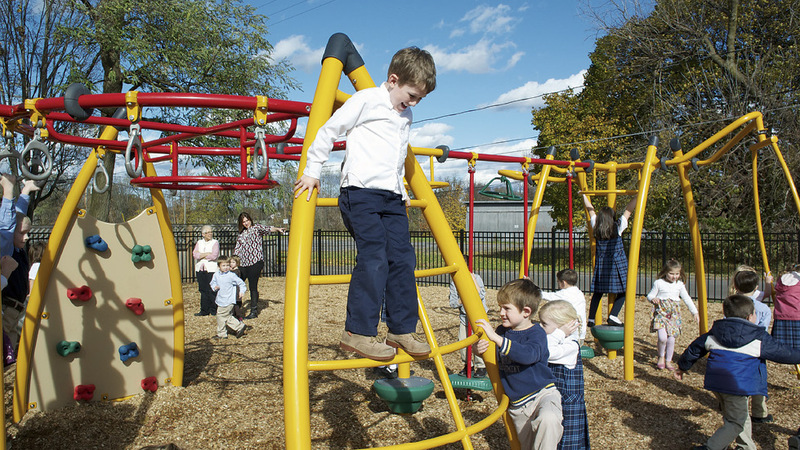 Before the play structure project began — it was dedicated and opened on October 30, 2013 — students had only a blacktop lot, shared by the school and church, on which to play at recess. That access was sometimes further limited by people using the lot for weekday church parking. Even with the church, community and diocese’s help with fundraising, the project was not without roadblocks. The land behind the school needed to be prepped and leveled before construction could begin. Town building permit and code restrictions slowed the progress, as did a drainage problem and extra expenses for sand, stone and mulch. Henderson said that despite those obstacles, help always appeared when it was needed, from both far and near. St. Mary’s alumnus Charles “Chip” Dowd, who now lives thousands of miles away from Baldwinsville in Olympia, Wash., donated thousands of dollars to the project. The diocese’s Catholic Schools Office also gave a generous donation to help build the structure. And St. Mary’s pastor, Father Joseph Scardella, offered consistent support as the playground was being planned and built. Not only do the students have a better place to play, they are reaping the health benefits of increased exercise on the playground.